A vicar from Kent has set a new world record for the longest outdoor preach. 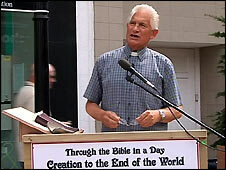 The Reverend Eric Delve started his marathon Bible-reading session in the centre of Maidstone on Friday at midday, finishing 24 hours later. He started with Genesis and skimmed through the whole Bible to Revelations, and was allowed short breaks to eat. It was in aid of the Detling Summer Conference, an annual Christian camp which takes place at the Kent County Showground from 2 August. The sponsored event raised funds to enable local people with limited resources to benefit from supported places at the event. Mr Delve, of St Luke's Church, in Maidstone, said: "It started off as a bit of a laugh and then sort of gathered momentum, and then every friend that I phoned up said 'you're mad, but we'll back you'." In April 2004, his church handed out free tickets for the controversial film The Passion of the Christ. He also encouraged people to see the film The Chronicles of Narnia because of its claim to religious connections.